Although I took this photo during our last snow, this is what it looks like here in the Four Corners today. It is cold and snowing. This probably isn’t a good photo to use for depth but I’m using it anyway. ← F I R E ! ! ! Pristine! Snow is pretty but I am happy when it avoids me! Me too Tildy! Me too. 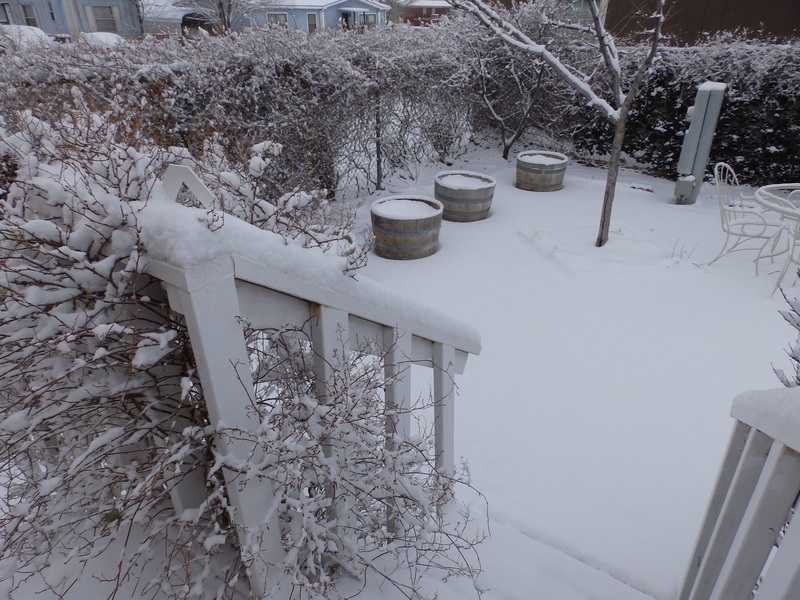 All white now, but I can imagine how prettty your garden will be in the spring. I’m not a fan of the cold either. In fact, I’m trying to sell my home to move to Arizona where it is much warmer. (And where my children and grandchildren live). Aw, thats nice PJ. There’s nothing like the comfort of family nearby. Yes, family is the best! (Most of the time. haha) but I have to sell my home first and that might not be easy. OH Pj where in Arizona ? I have cousins in Phoenix, used to go visit them a lot and loved it! Phoenix – West Side. Would be cool if I am able to move there and get to meet you!! THAT would be AWESOME! And meant to say I liked your picture, I love the beauty of the pristine whiteness of the snow! Thank you! It was snowing when I took the picture (and had been snowing). Brrr, that looks cold – but it is beautiful at the same time. I prefer looking at snow on someone else’s blog rather than having it up close and personal. I so envy your beautiful snowy backyard!! – nothing but rain here on the westcoast! lol!! We may get some yet! Snow Snow, when will I get to see you?! I know. I wish I could though! Does London usually get snow or not usually?